This blog entry is in English since it may be of broader interest. Jira is a very flexible and powerful issue tracking system. fence IT uses Jira to support a variety of processes. Having lots of issues assigned, which can’t be worked on. Wasting time regularly browsing through your assigned issues. Getting used to these issues, that you will take care later. Forgetting to finally work on them when they are due. The Scheduler is a Jira plugin, which offers this functionality. It also offers additional possibilities like recurring issues. However, only an administrator may configure such issues. The Scheduler was not a good choice for us, since it was too complex and did not allow normal users to schedule an issue for later resolution. We chose a different approach, which needs some more work to setup (than just installing a plugin), but was finally a better solution for us. It consists of the following steps, that will be described in more detail afterwards. Setup a new user called “Sleeper”. Create new custom fields “Activation Assignee” and “Activation Date”. Create a new screen, used when sending an issue sleeping. 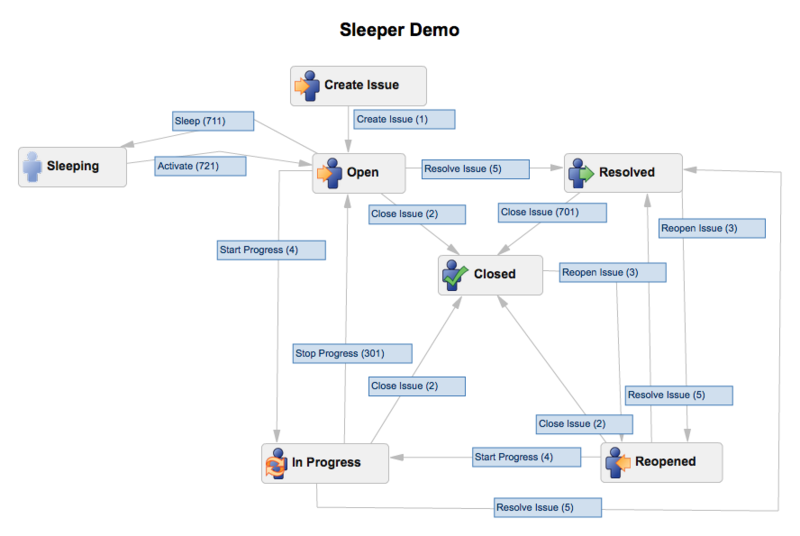 Extend all workflows, which should allow issue scheduling with an additional state (we called this state “Sleeping”) and transitions (“Sleep” and “Activate”). Create a filter to show all sleeping issues. Configure Jira to allow for the execution of Jelly scripts. 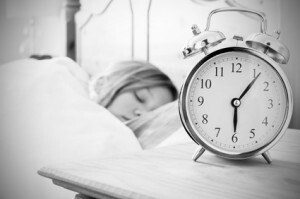 Install a Jelly script to periodically check for sleeping issues to activate. This plugin provides additional conditions, validators and post functions to personalize workflows of JIRA. This plugin provides administrators a panel similar to the Jelly Runner, except it will interpret a script to be run on the server. It also allows admins to quickly write functionality to support their business processes in their workflow, without the hassle of writing a fully-fledged plugin. Install both using the plugin manager of Jira. Create a new user called “Sleeper”, username “sleeper”. The user should be member of the group “jira-users”, and thus be allowed to login. Choose applicable issue types and projects according to your needs. Choose applicable issue types and projects as above. Add the fields “Activation Assignee” and “Activation Date” to the screen. Enter description: “Status for issues waiting to be activated”. Select or upload an image as you like. Add the newly created status to the workflow. Enter description: “Send issue sleeping until activation is due”. Assign previously defined screen “Sleeper” as transition view. Select the fields “Activation Assignee” and “Activation Date” and add them to the required fields. Select the “Activation Assignee” as source field and “Assignee” as destination field. Jelly scripts are by default disabled, but are needed in order to run the script in the next step. Please configure Jira as described in https://confluence.atlassian.com/display/JIRA/Jelly+Tags. on line seven, you might want to change the comment. Make sure, the script may only be read by the user which runs Jira on your system and nobody else, since there is a plain text password in this script. The same applies by the way for the file “dbconfig.xml”, where the plain text password for the database is stored. 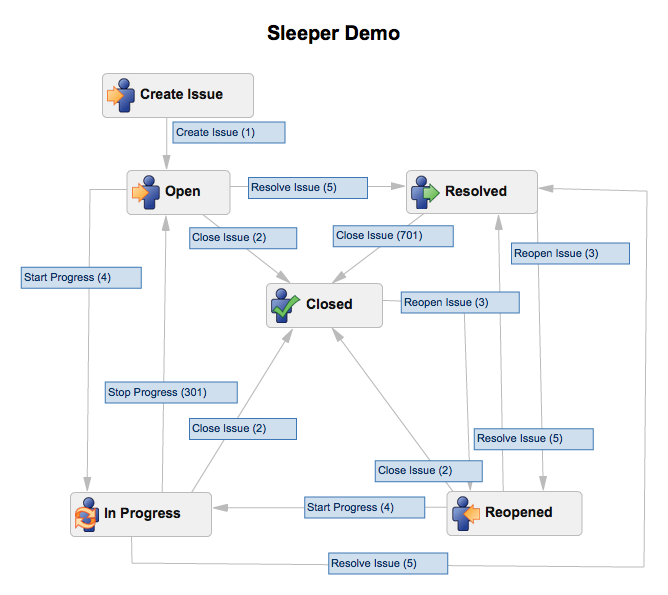 I wrote this tutorial after having implemented Sleepers in our installation of Jira. I did not test this tutorial, so although I tried my best to put all bits and pieces together, some configuration might have slipped. Please drop me a comment, if you encounter problems and I will fix the tutorial. 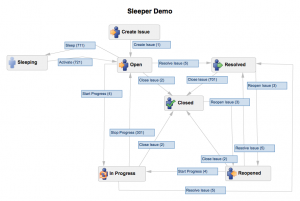 This tutorial is based on a locally hosted Jira, using Jira version 5.2.4. Plugins used are Script Runner 2.1.3 and JIRA Suite Utilities 1.3.5.